On July 7th, 2012, I'm lucky to attend this event presented by CLEO and REVLON at Gandaria City. 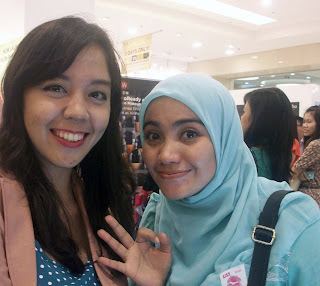 It was a cinema day, watching The Amazing Spiderman at IMAX XXI Gandaria City with fellow beauty bloggers and CLEO readers. I guess some of you may question why Revlon is there? LOL. Well, one of the main cast in The Amazing Spiderman; Emma Stone, who acted as Gwen Stacy, the love interest of young Peter Parker. Nah, Emma Stone is the brand ambassador for Revlon. Got it now? To be honest, I am never been a fan of any superheroes and its movies. So, when this movie became a hype, I just stayed calm, until I found out that it's Emma Stone who act as Gwen Stacy! YAY! I am always be a big fan of her ever since. She's so funny and she always know how to dress properly. So, at first I tried my luck on CLEO's quiz. Sadly, I failed. Well, not until I saw Stella's post on IBB's FB group. Hihi. Actually, I was late on that (it was posted in the evening, and I just saw it late night), fortunately enough, I could make it. So, I went to Gandaria City with one of my friends; Reni. We were never been to Gandaria City before, so we ended up coming so late (it was 9 AM, but we came around 10.30 AM), I met Shella, who was late like me. Haha. Another luck, we did not miss that much of the movie and I could still understand the plot. Well, the movie was awesome (for someone who came up late like me), there are tons of kissing scene haha, and I love Blondie Emma Stone! She always look pretty as usual. After done watching the movie, we were escorted to METRO Department Store where the Revlon Photoready Collection Pre Launching Event held. At first we have to re-register ourselves then we were welcomed by mini snacks and drinks. The launched products were shown in a train case like this. There was also mini games where I won one goodie bag from CLEO (yay!) and it continued with the make-up demo by a make-up artist whom the name that I forgot (sorry!). 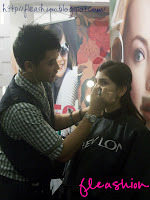 He was using the whole REVLON Photoready collection starting from the Primer, Foundation, until the Eyeshadow and Blush. The model was gorgeous, though. What amazed me the most was the Revlon Photoready Airbrush Mousse Make Up which is so light and results in a very natural look on our face. Its photo-chromatic particles also created some kind of shimmery look which looks a lot like glitter (but it's not). While wandering around, one of Revlon's BA offered me a mini make over using some of Revlon Photoready Collection. Hihi, unfortunately I forgot to take before and only has this after look. He put Photoready Airbrush Mousse Makeup, Two Way Powder Foundation, Eye Primer+Brightener (which can also be used as concealer), and Sculpting Blush Palette. To be honest, the Airbrush Mousse Makeup feel so light on my face while providing medium coverage. The Two Way Powder Foundation, which was applied after the mousse concealed my acne scars completely. I love it! 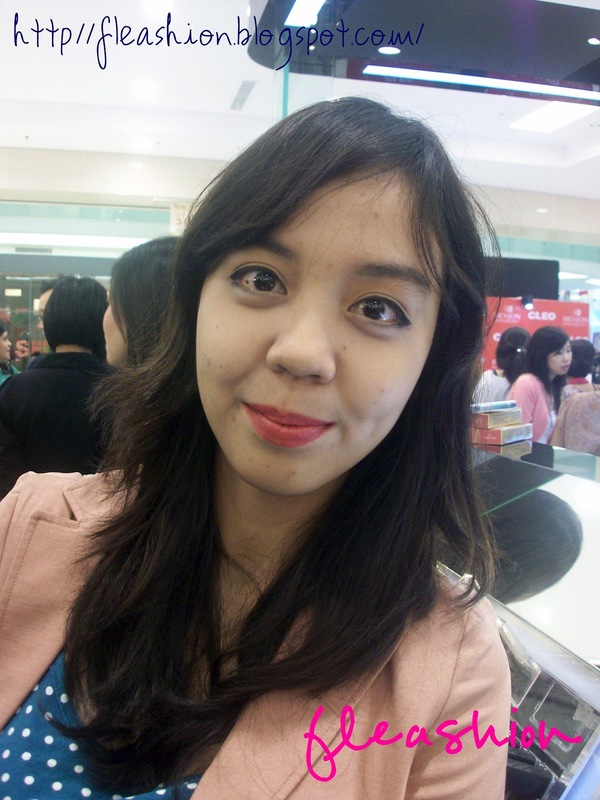 Though I don't find the Eye Primer+Brightener satisfying since it can't cover my dark circles. My favorite among those mentioned products is Sculpting Blush Palette! And it comes in 3-in-1 palette which included Highlighter, Blush, and Contour Blush! Perfect for on the go. Fufufu. So, what's in the goodie bags? Well, I gotta say that the things inside goodie bags is A LOT. I got four goodie bags including one from winning the games. As you can see there are purple pouch, pink fan, CDs, Revlon Voucher, Compact Powder, and Hair Dye. Actually, I also got The Amazing Spider Man's movie poster, but when I tried to open it, it was torn. Ah, that's so unfortunate since torn part is Emma Stone's! Grr. Anyway, the only beauty products that I've got are these two: Revlon Colorsilk in Medium Golden Chestnut Brown and Revlon Photoready Two Way Cake Powder Foundation in Medium Beige (will be reviewed soon). I am so happy since I'm planning to dye my hair, though it's not the color that I want, hehe. Moreover, I don't have any compact powder nor any powder foundation. Basically this is the best gift. That's it. That's all. 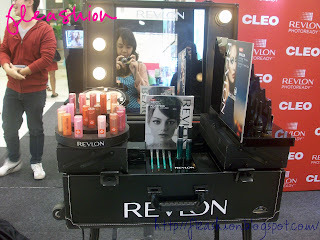 I thanked Revlon Indonesia and CLEO for making such a nice event and of course, for giving me the freebies. Moreover, I was so happy because I can meet and took a picture together with my most favorite twitter personality; Fatima Alkaff (@ftkf)! See you all on another beauty event!